I cruised by Liquor Barn out at Springhurst yesterday after work to (again) try Falls City Beer‘s Hipster Repellant IPA and to snag one of those cool Falls City mason jars. I hadn’t been to Liquor Barn in a while, however, and had forgotten just how much great beer they have on tap. Of course, if you know what you’re doing and you have 40 lines at your disposal, you’ve got a pretty good head start. I started off with a pint of the Hipster Repellant ($4, keeps the pint, a special deal yesterday evening), and perused the draft list as I enjoyed it and chatted with some of the staff and others on hand to get their beer on. A great feature of the tap/tasting bar is that you can get two-ounce pours for 75 cents and six-ounce pours for $1.75 before deciding on a growler to take home. I didn’t get a growler this time around, but I did taste a couple of extra brews while I was there. One was a beer I’ve been curious about for a while but had not gotten around to trying: Country Boy Brewing Jalapeno Porter. All I can say is that if you haven’t had this stuff, you need to. Like, today. It has such an intriguing depth to it — it possess all the characteristics you’d expect from a good porter, and adds a light jalapeno flavor, and just the tiniest bit of a spice kick that lingers on the palate. Nicely done. 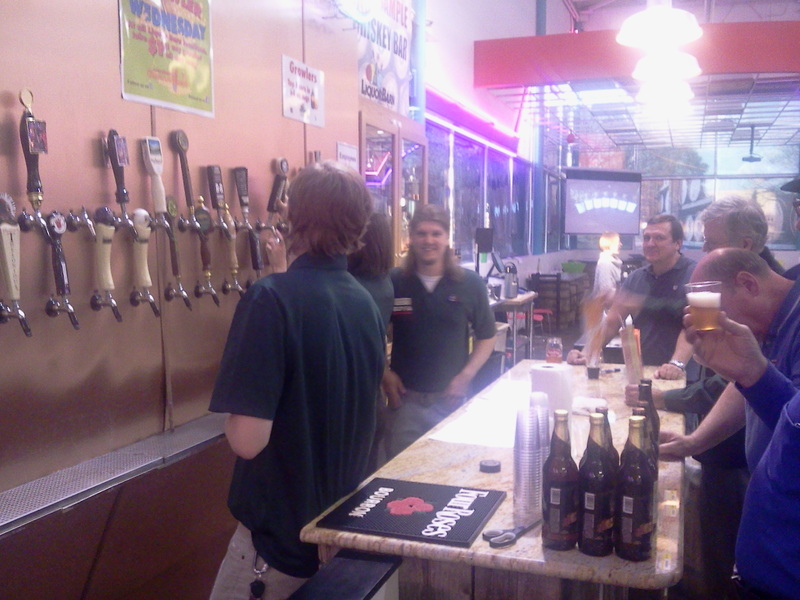 I also had a six-0unce pour of Green Flash Brewing Company Symposium IPA at the recommendation of one of the Liquor Barn employees. I’ve had Green Flash beers before, but I don’t recall ever having the Symposium IPA. According to the Green Flash website, this is the third go-around for the beer since 2008, and I can see why they keep bringing it back. It has a floral and citrusy nose, and the flavors explode once you take a drink. The beer description at the site notes that Green Flash placed a “profound emphasis on hop extravagance” — that’s putting it lightly. Apparently, the brewers added hops at every step of the brewing process, and the result is a highly complex and unique flavor in a beer that is still light bodied and crisp. Highly recommended. Yeah, I’ll be going back to Liquor Barn again soon. Hope to see you there.